Care of patients frequently focuses on the physical aspects of disease. Seldom are these individuals invited to share their spiritual and psychosocial needs, or discuss how their lives have changed as a result of their circumstance. And yet, seriously ill patients have indicated that the possibility of continued spiritual suffering adds to the distress associated with their illness. 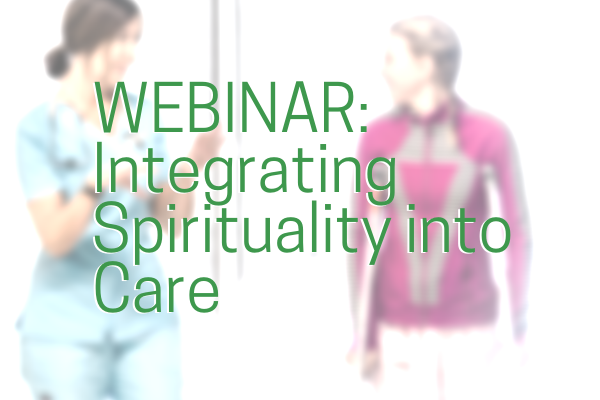 The “Integrating Spirituality into Care” webinar with Jeanne Weis, MN, BN, RN, CHPCA(c) on February 12 or 14, 2019 provides Licensed Practical Nurses the understanding needed to reduce this distress. Register below for this free professional development event. Jeanne’s passion about integrating spirituality into nursing practice grew through 28 years of practice, especially her experiences in gerontology and palliative care. She is an Executive Officer at the CLPNA and currently oversees five departments: Practice, Professional Development, Policy, and Research. Spirituality, broadly defined, gives meaning and purpose to life, and is often a central issue for patients dealing with cancer and chronic illness or those at the end of life. Growing evidence has demonstrated that spirituality is an important component of quality of life (allowing individuals to effectively face the circumstances of life, and cope with feelings of loss, hopelessness, despair, guilt, shame, anger, or abandonment), and affects patients’ healthcare decision making and healthcare outcomes. Despite a strong evidence base, few health care professionals are prepared to talk to patients about spiritual needs, believing that such discussions require a substantial time commitment and because they do not know how to meet such needs. Ways to integrate spirituality into person-centred care. Unable to attend or want to watch again? This presentation will be recorded and made available on our LPN Professional Development playlist on YouTube at a later date. This webinar is brought to you by the College of Licensed Practical Nurses of Alberta (CLPNA). There is no registration fee required to attend. A webinar is a live seminar attended using an internet-connected computer or mobile device, allowing participants in different locations to see and hear the live presenter and ask questions. Registration is required to receive the website link to the presentation and email reminders. QUESTIONS? Contact the CLPNA’s Professional Development Department at profdev@clpna.com, 780-484-8886 or 1-800-661-5877 (toll free in Alberta).